Regal, relaxing and resplendent… get ready to enjoy the George Chair in your home! Contemporary meets traditional with the sleek George wicker arm chair. 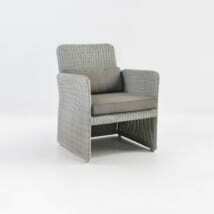 W35" x D37" x H33"
The George Wicker Arm Chair became a best-seller as soon as it hit our showrooms! Low lying, lovely wide seat and arms, elegant without being too dainty, and layered with plush Sunbrella® cushions; the George Wicker Arm Chair is the ideal fixture for a sunlit morning room for those comforting morning coffees, or in the midst of a lush garden setting to enjoy your flora and fauna in peace and harmony! And it suits many of our ottomans for extra comfort! 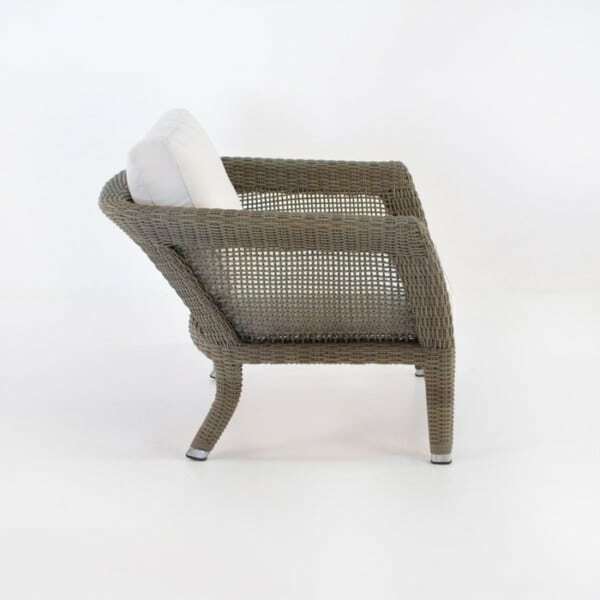 This divine wicker relaxing chair can be paired up with different materials and placed in many settings, it is simple and stately, an easy fix for any area! 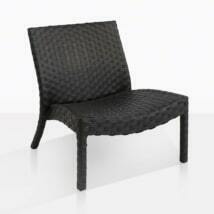 Set up a superb poolside setting with four George Chairs framing your swimming pool. Add a series of Milano Tables in between each one for cocktails on hot days! 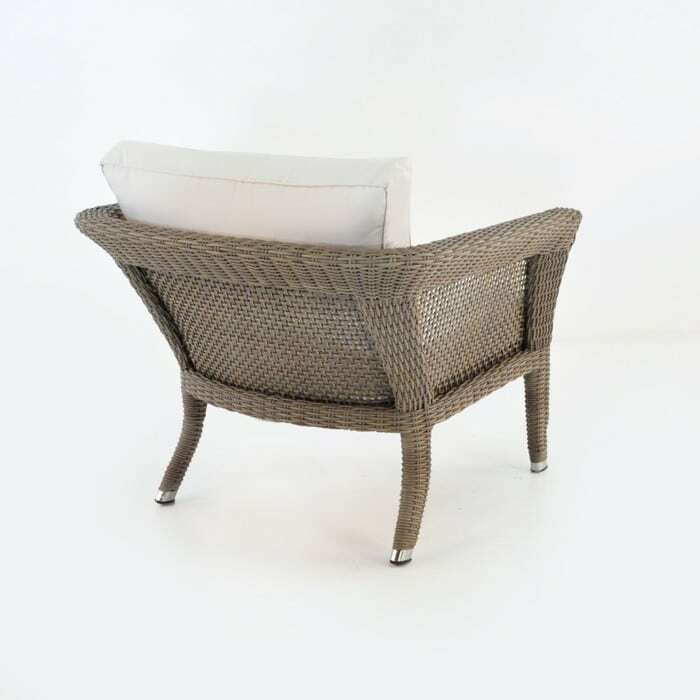 Place one of the George Wicker Arm Chairs on your porch with a Rocco Side Table in Kubu Wicker for a suitably stylish setting for the front of your home. Perhaps you have a commercial area that needs updating? 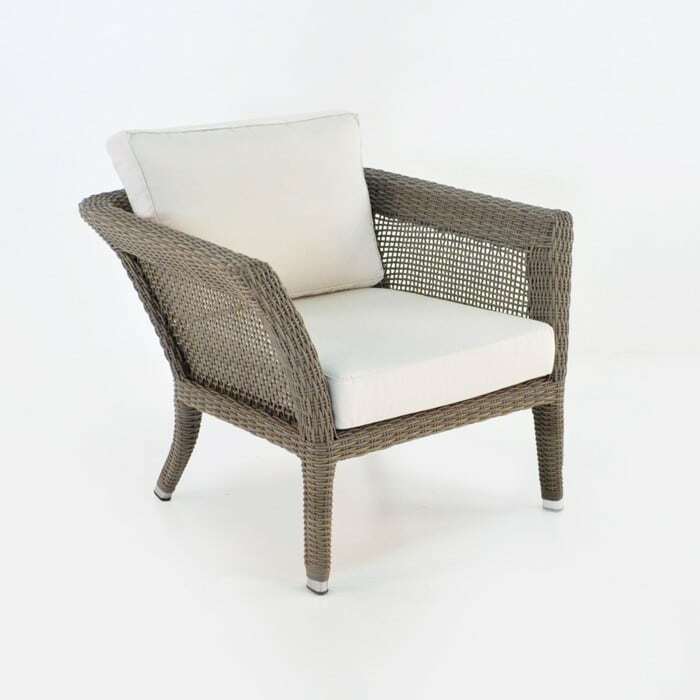 Place a couple of these comfortable wicker relaxing chairs underneath a sturdy Tiki Umbrella in Taupe, and put a Raw Concrete Square Stool in between, as a great little side table, and extra seat if you need it! 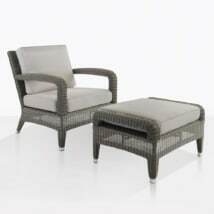 The George Relaxing Chair is made from award winning Viro® wicker in Kubu Gray; through dyed and UV treated for a long lasting product, it has a powder coated aluminum frame and comes with free Sunbrella® cushions as shown! Call Teak Warehouse today to find out what other combinations go with the magnificent George Wicker Arm Chair. Our sales staff are in store 7 days a week and are happy to help you discover what will work in your space! The George Chair is in stock, available for purchase and shipping today!